“Elite opinion” is admittedly a baggy construct—whose opinion? which elite?—but thanks to the weird convulsions of Campaign 2016, we’ve been granted a precious opportunity to behold it in all its lush and fulsome glory. Seemingly as one, the lead institutions of consensus-formation in the responsible American polis have discovered the white working class. And when I say “have discovered,” I of course mean “have recoiled in horror from.” Over at The Atlantic, Jonathan Rauch decries the complete surrender of our politics to a “chaos syndrome” that has elevated the voices of spittle-flecked merchants of anger such as Donald Trump and Bernie Sanders. Like all good keepers of elite discourse, Rauch complains that we have reformed the structures of representative government into a state of “insanity” by eliminating the means by which bipartisan horse-trading and legislative compromise are achievable, or even thinkable. The incremental struggle to democratize Washington has instead created a vast megalomaniacal pseudo-populist playground for demagogues in the Trump mold. And like all good centrist difference-trimmers, Rauch mourns the collapse of 2011’s congressional and White House “grand bargain” on government spending—overlooking the more grotesque species of insanity represented by an austerity accord that would have been enacted amid the fallout from a near-paralyzing recession. No, the great sin of the neglected grand bargain, according to Rauch’s corner of the sober commentariat, was to upend the closed-door politesse and rituals of deference due to D.C.’s governing class. Keen to pathologize populist discontent, Rauch adopts the tone of an admitting physician at an asylum for incurable populist delusion: “Neurotic hatred of the political class is the country’s last universally acceptable form of bigotry,” he writes—overlooking in the process much of the actually existing history of party politics in America. It is, of course, comforting to the media courtiers of our political class to imagine that what ails American public life is a shortage of deference to the D.C. establishment, as opposed to, say, the consolidation of a permanent ruling oligarchy or rampaging moneyed corruption. But Rauch’s structural critique is more than a little neurotic in its own right, in light of Freud’s classic definition of neurosis as a form of private religion: it amounts to a wish-fulfillment fantasy that the checks and balances of popular government have to function exactly as our founding generation decreed. The notion that the institutions of American governance may have hollowed themselves out under successive nihilist assaults on the public sphere and cynical manipulations of popular opinion is, for a writer like Rauch, simply impermissible. But Rauch, as I say, is but one leader of elite opinion urging a renewed politics of deference on the unruly ballot-wielding mob. New York Times writer Sam Tanenhaus delivered in this Sunday’s book review another sermon on the unsettling puzzlements of populism. By mobilizing white racial and nativist resentments beneath a vaguely populist defiance of politically correct thinking, Trump has short-circuited the power and influence of a conservative D.C. elite “who feel betrayed by a base that used to fall in line behind whomever the party chose for them at election time, but now is rising up in childish or addled rebellion.” Unlike Rauch, Tanenhaus freely concedes that the major-party establishments bear their share of blame for this season of chaos; they “have been steadily discrediting themselves at the same time that they grow increasingly captive to what the populists called ‘the interests.’” Still, Tanenhaus shares Rauch’s core suspicion that a socioeconomic revolt from below can only be unreasoned, spasmodic, racist, and destructive; the closest historical analogues to the present-day Trump and Sanders insurgencies are, he insists, the deeply bigoted Father Charles Coughlin and the authoritarian demagogue Huey Long, who spent the early 1930s attacking the fledgling New Deal. For Wieseltier, as for Rauch, the working-class interlopers of 2016 are fundamentally to be understood as a client population. There are at least two big problems with such an analogy. One is the basic problem of all historical analogies—the relevant pieces are too disparate and malformed to fit together smoothly. Trump is no Coughlin, Sanders is no Long, and Obama certainly is no FDR. In resisting the New Deal, FDR’s detractors were denouncing a giant mobilization of government resources and an intelligible liberal philosophy of mutual obligation in an acute economic crisis. In attacking Obama’s economic legacy, Trump and Sanders (operating themselves in wildly incommensurate registers of protest) are actually advocating for more expansive, non-neoliberal approaches to key economic issues of trade, employment, and (erratically, in Trump’s case) health-care provision. (Trump, of course, also goes out of his way to link these issues to the explosive politics of immigration, which eminently justifies the charge of bigoted pandering in his case.) And more fundamentally, by linking Trump and Sanders to, respectively, the most deranged anti-Semitic nativist in our modern mass politics and a would-be Mussolini of the Mississippi delta, Tanenhaus reinforces the same notion floated by Rauch: the Founders distrusted popular government for the simple, unassailable reason that the American people are drawn ineluctably to raving bigots and would-be totalitarians. Who are these unhinged, pitchfork-wielding yahoos, now rudely demanding their moment of reckoning at the expense of the institutions erected to discipline them? Novels and poems and paintings and films and songs may bring the news of distant or hidden sufferings and abuses. By creating sympathy, art lays the ground, the internal condition, for moral behavior. This does not mean that art must be, for moral reasons, didactic or pledged to a politics—though such art, tendentious art, bad art, may be socially and politically quickening, as dictators and their propagandists have long known. It was ‘The Deer Hunter,’ and not CNN, that most vividly illuminated for me the sources of volatility and the fury that are mutilating contemporary politics. Which is why the public airing of our fellow citizens’ pain must follow certain key quasi-aesthetic strictures, by Wieseltier’s lights. He calls out Ta-Nehisi Coates’s bestselling memoir of the ravages of white racism, Between the World and Me, as an imaginative work that fails the Deer Hunter test. Unlike the Michael Cimino Vietnam epic of the late 1970s, Coates today presents an “ugly and coarse” and unflinchingly didactic portrait of American white supremacy as a monolithic force created and sustained to enact the suppression of black political agency, and indeed of black bodies, via the depredations of the racialized political economy and the incarceration state. People in adversity turn not to economics but to culture. They are fortified not by policy but by identity. They seek saviors, not programs. And as the direness of their circumstances appears to imperil their identity, they affirm it by asserting it ferociously against others. We are, in other words, back on Jonathan Rauch’s analyst couch. But there’s something more risible in Wieseltier’s politics-of-culture complaint than in Rauch’s wan wish that our restive voting class would simply abide once more by the many gentlemen’s agreements that get legislation passed. For starters, readers of the above litany of pathology might well ask, “Who do you mean ‘they,’ Mr. Brookings culture-canvasser?” There’s a world of cognitive and political presumption concealed in Wieseltier’s casual invocation of the “we” who are to experience aesthetic and political sympathy and the “they” who short-circuit its proper operation with the rude politics of grievance. For Wieseltier, as for Rauch, the working-class interlopers of 2016 are fundamentally to be understood as a client population—people whose grievances, aspirations, and life chances are all to be delineated and managed by a class of political administrators and cultural interlocutors. When they stray outside this foreordained rule, chaos, fascism, and unhinged bigotry and paranoia are the predictable outcomes. But pause a moment to consider what’s meant by the notion that the nation’s injured classes, left to their own devices, “turn not to economics but to culture.” This airy declamation, too, elides a sprawling world of real-world historical causation—one that, most inconveniently for Wieseltier, largely coincides with his three-decade tenure at The New Republic. If, as the newly class-conscious Wieseltier now complains, “the American poor more or less vanished from our political discourse,” that’s in no small part because The New Republic of the Wieseltier vintage sent them packing. If “the American poor more or less vanished from our political discourse,” that’s in no small part because The New Republic of the Wieseltier vintage sent them packing. During the joint reign of Wieseltier and publisher Martin Peretz, this pre-eminent organ of neoliberal opinion waged its own quite pitiless culture war on dispossessed Americans of every background. As it sought to discredit popular reformist uprisings in Central America and carry water for the upward redistribution-of-wealth scheme known as Reaganomics, the eighties New Republic was embarking on a broad-ranging redefinition of the Washington moral imagination that would, over the long haul, ensure that the left-behind cohort of working-class Americans would have little other than cultural forms of effective dissent at their disposal. 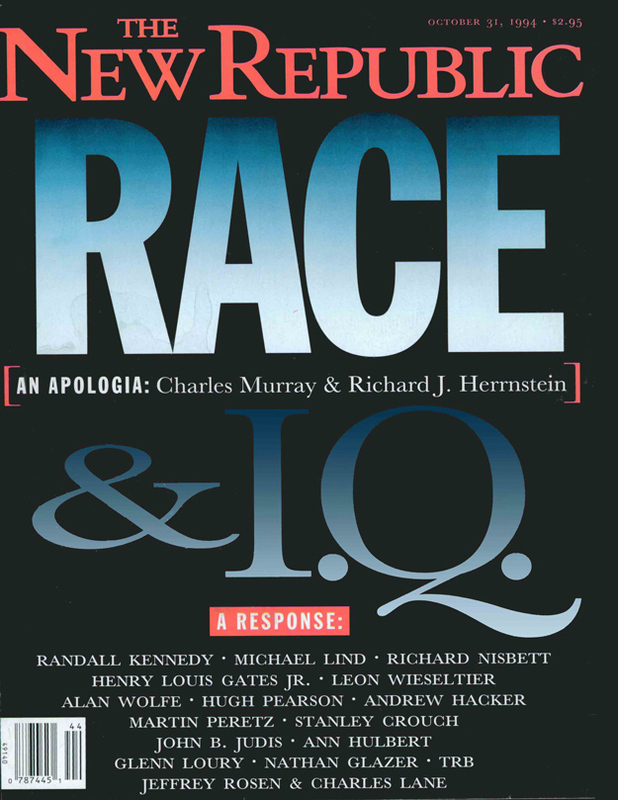 And on the issue of racial representation that now so exercises Wieseltier’s gate-keeping muse, The New Republic has been a uniquely bad actor, lending legitimacy to the discredited quasi-eugenicist researches into racial IQ performance performed by libertarian hack Charles Murray while urging on Bill Clinton’s repeal of Aid to Families with Dependent Children with a cover editorial and image that were little more than racist propaganda. (And yes, for good measure, the policy journal also dealt a death blow to Bill Clinton’s bid to reform health care twenty-plus years ago, ensuring that working Americans would be saddled with unsustainable costs for an indispensable social good until the singularly anemic Affordable Care Act finally came along in 2010.) And coming into the aughts, this putatively liberal oracle was a cheerleader for the 2003 invasion of Iraq—a cause so close to Wieseltier’s heart that he signed a letter imploring the Bush administration to invade that ran in William Kristol’s neocon journal The Weekly Standard. This last episode bears mentioning here because as Wieseltier explains at the outset of his inquiry into the pain of the lower orders and their imaginative deficiencies, he was stirred to engage seriously in these matters by his recent re-viewing of The Deer Hunter. That movie was indeed a powerful evocation of a working-class world that is no more, yes—but it was also an excoriation of the cultural and political catastrophe of the Vietnam War. Cimino’s film wasn’t so much a paean to the lost folkways of the Pittsburgh steelworker tribe as a howl of protest over the senseless sacrifice of life and well-being within that community at the behest of a cynical, destructive American imperial state. (The Deer Hunter also has some serious problems in its caricatured and racist depictions of the North Vietnamese, but I don’t want to distress the jittery Mr. Wieseltier with yet another plaint of grievance.) More than 58,000 Americans died in that viciously senseless conflict—and most of them were middle-to-working class, thanks to the politics of the draft. There’s something more than a little deranging in the spectacle of a serious Washington intellectual reporting that his conscience was awakened to the struggles of working Americans by the opening reel of Cimino’s epic without ever so much as mentioning the geopolitical conflict that irreparably destroyed the working-class world he is trying, and mostly failing, to empathize with. But for longtime observers of the D.C. press scene, this is no real mystery: the solemn question of where, when, and how to frame realpolitik deployments of American power, like the selective upbraiding of our dispossessed masses, is an exclusive monopoly of the responsible moralizing class. From one admittedly didactic and tendentious point of view, you might dub this a first-order failure of the moral imagination. In any event, it is most certainly something to sigh over.